Dental x-ray refers to a form of electromagnetic radiation, which is used for imaging and detection of any dental disorders. Dental x-ray equipment plays an important role in the diagnosis and treatment of dental related diseases. This x-ray equipment is used for various applications such as cavities detection, tooth roots glancing, abnormal bone or teeth densities and checking status of a developing tooth. 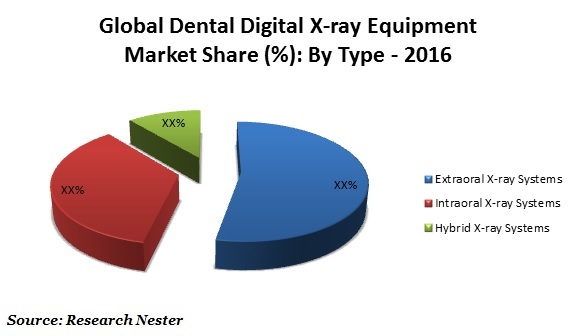 The global dental digital x-ray equipment market was valued at USD 2,027 Million in 2015. Further, the global dental digital x-ray equipment market is anticipated to witness a high compound annual growth rate of 8.5% between 2017 and 2024 and is expected to reach USD 3,102 Million by the end of 2024. The technological advancements in dental x-rays equipment is playing crucial role in the growth of dental digital x-ray market across the globe. Asia-Pacific is likely to expand at the highest pace across the globe owing to the growing healthcare infrastructure and rising disposable income. Increasing incidences of dental disorders in the region owing to the unhealthy lifestyle is also anticipated to create the demand for dental digital x-ray equipment over the forecast period. Apart from this, rising medical tourism in the region is swelling the demand for technological advanced healthcare equipment such as dental digital x-ray equipment. With growing geriatric population, the number of people suffering from dental disorders has increased in a remarkable way. The prevalence of unhealthy lifestyle in developing and undeveloped countries further, increases the oral and dental disorders patients. These factors are believed to bolster the development of dental digital x-ray equipment market over the forecast period. Technological advancements are one of the major factors driving the market of global dental digital x-ray equipment. For instance, cone beam computer topography - latest dental technological advanced equipment, is penetrating the dental digital x-ray equipment market owing to its increased application in various dentistry and periodontal surgeries. Further, the trend of digitalization is expected to positively impact the growth of dental digital x-ray equipment market during the forecast period. Further, an awareness program on the dental diseases and their effects is also making inroads for the development of dental digital x-ray equipment market. In addition to this, increasing number of dental clinics is expected to intensify the growth of this segment. However, high cost of dental digital x-ray equipment market is expected to hamper the growth of the market. Also, the higher risks associated with the usage of dental digital equipment such as cancer and others due to high exposure to radiation, is anticipated to hamper the demand for dental digital x-ray equipment from the hospitals. The Yoshida Dental MFG.Co. Ltd.